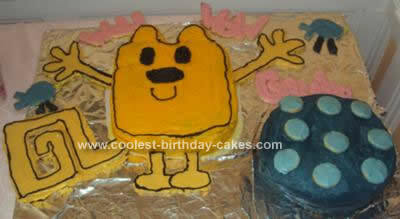 This Wow Wow Wubbzy Birthday Cake was for my niece’s 4th birthday party. She specifically requested Wow Wow Wubbzy and asked that I make it a chocolate cake. I used a rectangular cake pan and cut the edges so that it would look more rounded like Wow Wow Wubbzy. I also made a round vanilla cake and frosted it with vanilla frosting that I dyed blue to represent his ball. The polka dots on the ball, the bird, Wubbzy’s arms, legs and tail I made out of butter cookie. I rolled out the dough and then cut out the shapes with a little knife. The cake was a big hit ! I forgot to state that I dipped the butter cookie pieces (arms, legs, tail etc…) in melted white chocolate that I had added food coloring too. After I dipped them I put them in the fridge to harden. This gives it a glossy finish and also makes the pieces sturdy. This helped when transporting the cake so the cookie pieces didn’t break.